This recipe goes out to all of you who requested more vegetarian recipes and I promise to bring you even more. But if you’re vegan, don’t worry. There will always be a vegan option and in this case, just switch out the cheese for vegan Mozzarella or Swiss. Vegan cheese doesn’t melt quite as well, but if you have a favorite, please comment below so your fellow readers can look for them! I’d be especially interested in your experiences with those that melt. 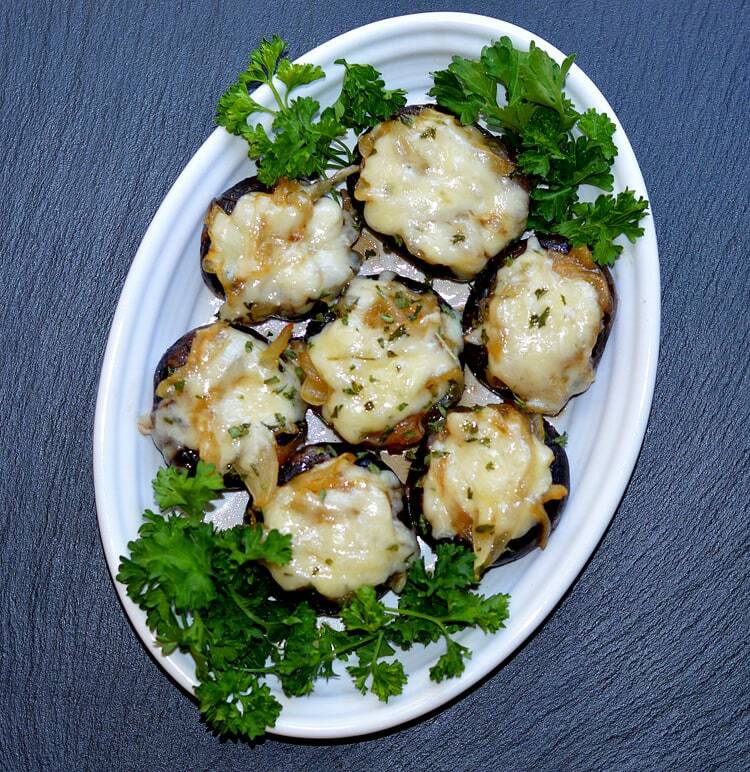 Anyway, these French Onion Soup Stuffed Mushrooms were born from wayyyy too much time spent on Pinterest … you can relate, right? Please tell me that it isn’t just me 😉 Ree Drummond, a/k/a The Pioneer Woman, posted a recipe and this is my interpretation. I tweaked it a bit, but I absolutely loved it! Definitely a winner. I started with Cremini mushrooms. 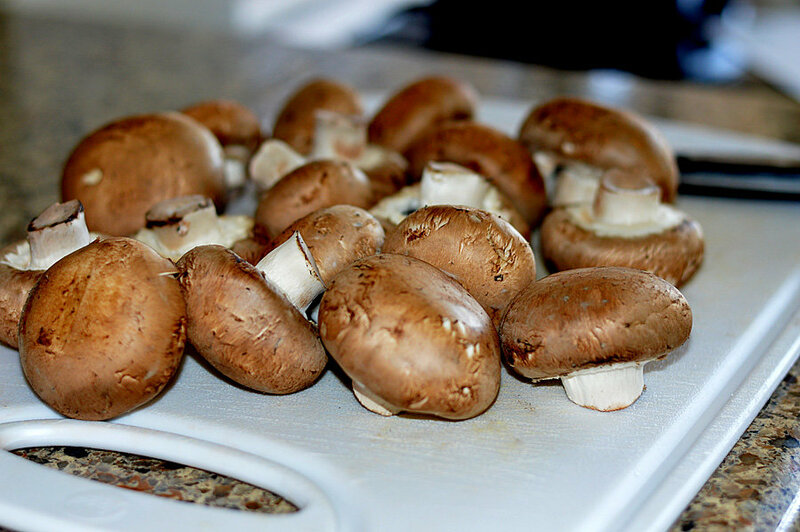 You can use white button or whatever similarly sized mushrooms are available to you. Wipe clean and remove stems. 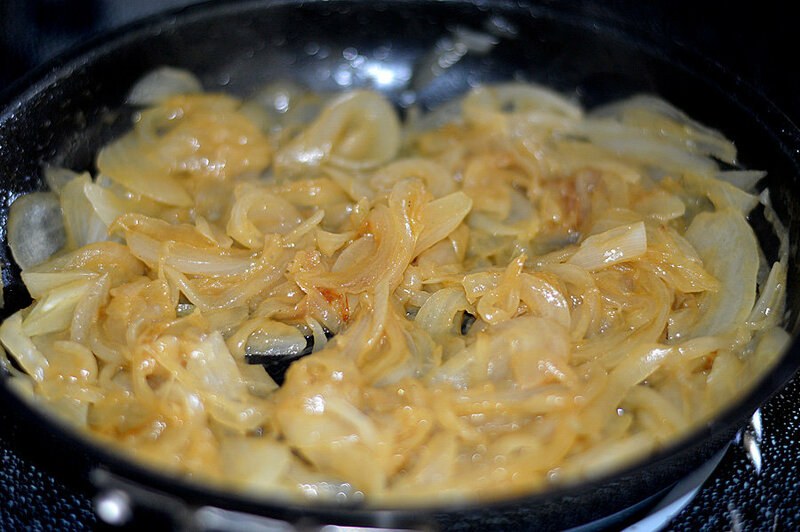 I caramelized the onions until they were soft and golden. To do this, and I am sure some would disagree, I love to use small amounts of both oil and margarine (vegan margarine is readily available). I feel it adds both flavor and moisture to the onions. I don’t want just browned onions, I want them plump and juicy! To the onions, we’ll be adding a splash of wine (red or white – whatever you have on hand). I have no association with this company, but Barnivore.com is a GREAT resource for finding out which wines are vegan. We’ll also be adding worcestershire sauce (here’s a vegan alternative or two) and either vegetable or mushroom broth. I LOVE this mushroom broth. It’s dark and flavorful! Cook until most of the liquid evaporates. Remove the onions and in the same pan, add another dab of margarine. 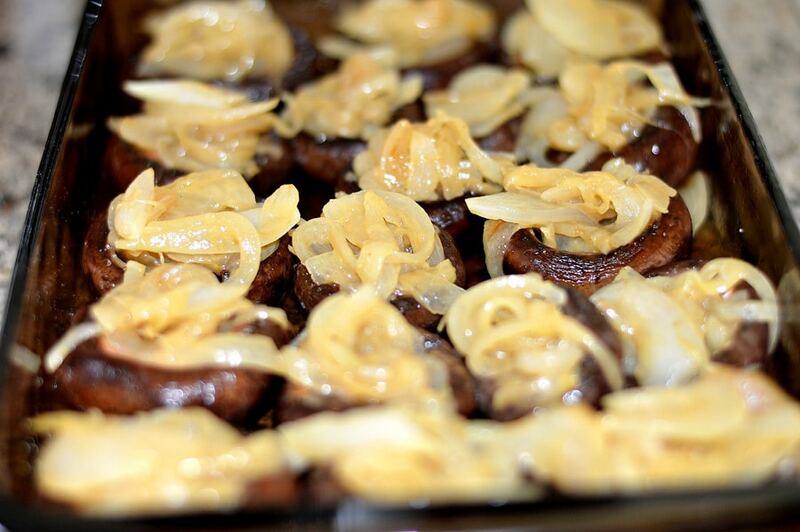 To this, add your prepared Cremini mushrooms. This is going to help give flavor and give us a head start on the cooking process. Give them a good toss and cook for a few minutes until they look like this. I like them all up, cap side down, and give them a pinch of salt. Top with the caramelized onions. Next comes the cheese. For a vegetarian option, Gruyere is the cheese of choice. For vegans, shredded mozzarella works nicely. I added chopped parsley before baking. Bake at 325 degrees for 10-15 minutes just until fork tender. I don’t like to go too long because I prefer they hold their shape and have some texture to them. To finish these off, I add a pinch of salt and they are perfect ‘as is’. 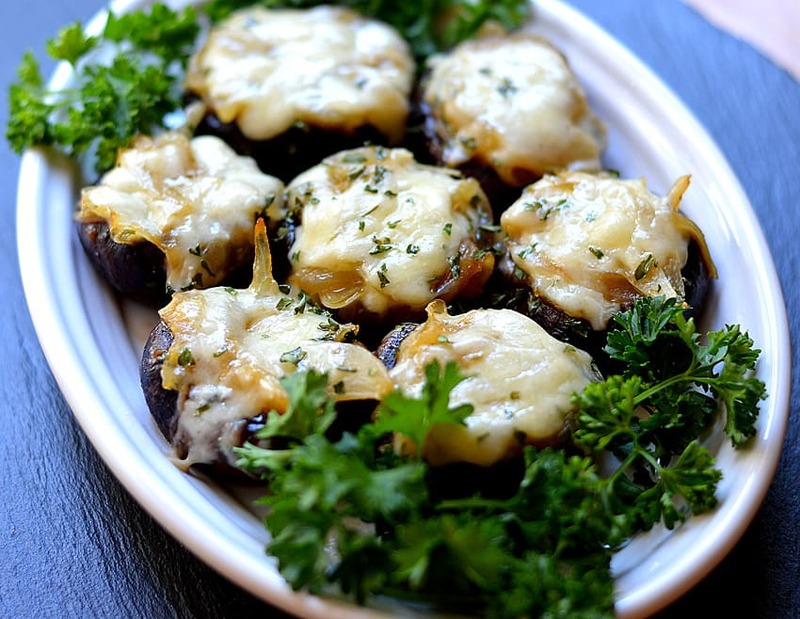 Great as an appetizer or main dish, I think you’ll really love these little gems. 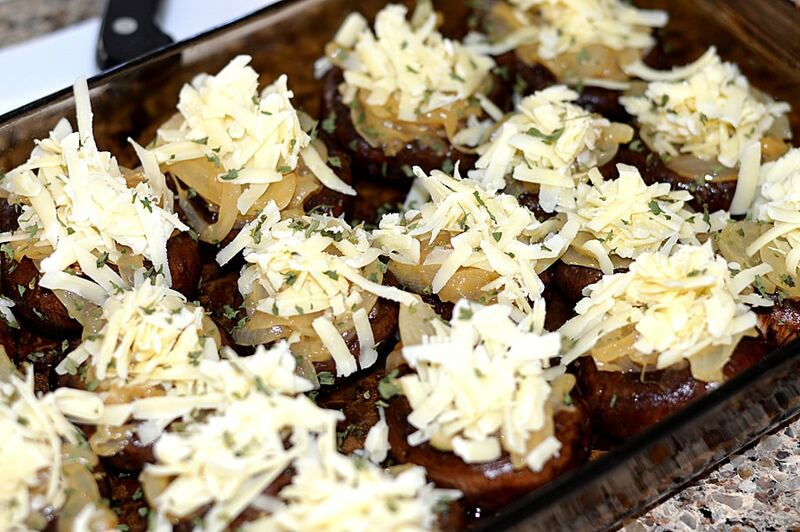 If you make this recipe for French Onion Soup Stuffed Mushrooms, please leave me a comment and let me know what you think! It also helps other readers to hear your thoughts, ideas and variations on the recipe. Wipe mushroom caps, remove stems. Slice onions and saute over medium-high heat in 1 Tbl of margarine/vegan margarine plus 1-1/2 tsp of oil and sugar until tender and translucent. Season with salt and pepper. Add the wine, worcestershire/vegan worcestershire and vegetable or mushroom broth. Cook down until the liquid is almost all evaporated. Remove the onions and add 1 Tbl of margarine/vegan margarine to the same pan. Add the prepared mushroom caps and toss well to coat. Cook for a few minutes until just starting to get tender. 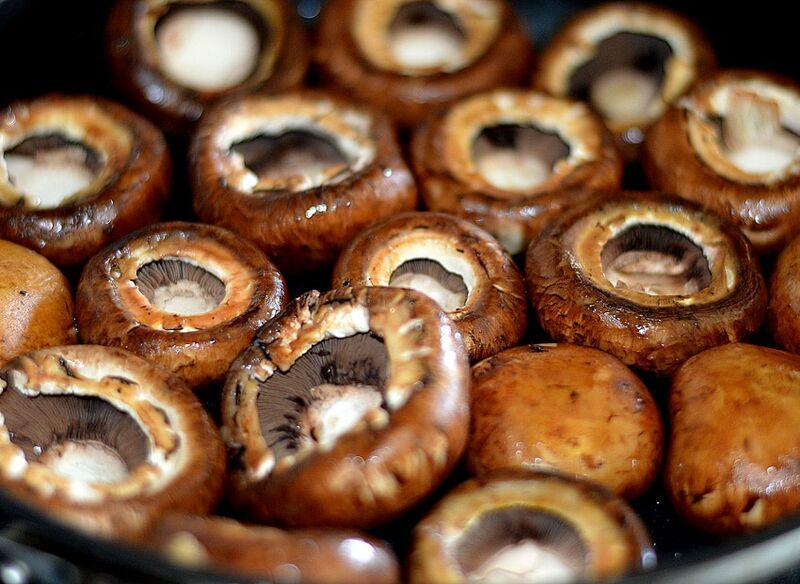 Arrange the mushrooms, cap side down and season with salt. Fill each with a generous spoonful of onions and top with cheese/vegan cheese shreds. Lastly, top with chopped parsley. Bake uncovered for 10-15 minutes or until fork tender. Don't overcook, you still want to have some "bite" to them. Season with a pinch more salt if desired and serve immediately. Can’t wait to make this recipe, have already rushed out and bought my mushrooms and some gluten free Worcester sauce but I have a problem with the red or white wine as I do not drink at all so was wondering if I could substitute red or white wine vinegar instead???? Any thought???? Will also comment tomorrow when I have made this recipe although I will be leaving out/substituting the cheese for cooked tomatoes as I am a thyroid patient and react very badly to anything processed. Will let you know how I get on. Made this last night and OMG. We are vegan, so we used Earth Island provolone, our favorite cheese. It melted pretty good after a quick broil. It does melt really well into any dish, like mashed potatoes or filling for burritos, after a few stirs. But it melted just enough for this dish. We are going to try this on a bigger scale in the big portobello mushrooms. 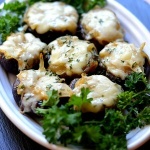 I have some portabella mushrooms I’d like to try this with? Have you tried that?